By Suzanne | February 4, 2013. For more than a decade, the South Inner City Community Development Association has been a place where Liberty residents could prepare for job interviews, practice their communication skills and update their CVs. In a time when record number of people are looking for work, SICCDA, as it’s known in the community, has been helping even more with job placements and preparation. 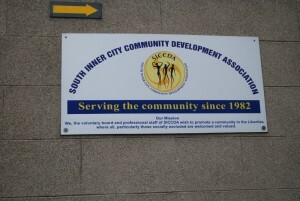 “So many people have come during the recession,” said Father Michael Mernagh, programme manager of SICCDA’s Job Club. Mernagh said he has seen an increase in members, especially from the non-Irish community, who came here during the economic boom then lost their jobs. The language barrier, as well as the lack of skills, has made it more difficult for this group of people, said Mernagh, but SICCDA offers English classes to overcome that barrier. Caroline O’Neill, who has been working as the club’s assistant for over a year, said people can join each month and register for the free four-week program, which meets three times a week on Mondays, Wednesdays and Fridays. “They come in as individuals, but then we bring them together. We get them to share their experience and their vision for the future for themselves,” said Mernagh. O’Neill said SICCDA offers participants the opportunity to use computers, e-mail and newspapers as they prepare for job interviews. “It’s not really like a classroom setting, because we would be aware that some people maybe had bad experiences when they were younger,” she said. For those who prefer one-on-one help, they can come in to get their CV updated or do a mock interview when needed, said O’Neill. At the end of the program, the placement process starts. Mernagh said this is the most important step, and that prospective employers in the South inner city area are contacted to help with the placement. “There is no point in building up people’s hopes and training in for something, and then there is no work,” said Mernagh. Even though SICCDA has been around for 30 years, there are still people who go to the office without knowing of its existence, said Alice Dadis, a program trainer. The next program starts Feb. 11, and the latest initiative is to create a larger employer database that would allow SICCDA to place more people who come out of the program or are already prepared to find a job. SICCDA, which receives funding from the Department of Social Protection, offers other activities for the community, including after-school and life-skills program. The office is located on 90 Meath St., next to St. Catherine’s Church. Corina Ferrer Marcano was part of a team of students from Columbia College Chicago who traveled to Ireland to report and write about the Liberties.